This book continues to be controversial. Only this past spring, I was asked to help fight a push to not just remove this book from the twelfth grade curriculum of a public high school, but to remove the book from the school library, as well. The irony is that this school is located not far from the reservation Sherman Alexie grew up on. I’m glad to say that the school board wisely decided to keep this book both in the twelfth grade curriculum and on the library shelves. But this will not be the last time this book is challenged. I have said many times that this is one of the best books I have ever read. If you read only one YA book this year, or only one book about teenage boys, or about American Indians, or even if you only one book at all this year, make it this one. Then drop me a comment at the end of this post. Rowdy stopped screaming with his mouth but he kept screaming with his eyes. What kind of idiot was I? I was the kind of idiot that got punched hard in the face by his best friend. Bang! I hit the ground. Bang! My nose bled like a firework. His arrival at Reardan is equally fraught with surprises. Clearly, he didn’t have a lot of prior interaction with white people until this moment. “These kids weren’t just white,” he says. “They were transparent. I could see the blue veins running through their skins like rivers” (56). His description is hyperbole, almost, meant to emphasize the difference between life on the reservation that Arnold is used to and life in the very white, very non-Indian world of Reardan. 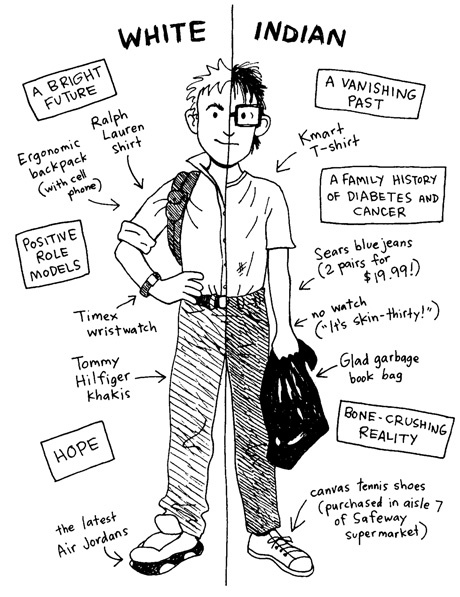 With conviction, humor, and just plain fearlessness (at times), Arnold learns to navigate his way both through the hallways of Reardan High and around the reservation. Those familiar with Sherman Alexie will recognize that this novel, while intended to be fictional, is really fictionish—portions of it greatly resemble his own story. They will also recognize his playful use of language, his unflinching portrayal of alcoholism, and his insistence upon telling the truth. Of this book, the Guardian said: “Opening this book is like meeting a friend you’d never make in your actual life and being given a piece of his world, inner and outer. It’s humane, authentic and, most of all, it speaks.” I can’t think of a better description. If you read just one YA novel this year, make it this one. In many ways, this book is the Jay’s potato chips of YA literature. I had to read this book as an assignment for a class, and had only to read through page 60 or so—a half hour’s reading for me. However, I ended up reading not just to page 60, but all the way to the end, twice, in a single evening. The voice was so authentic and the story was so compelling that I literally couldn’t put the book down. I know I’ve come across something special when I’m holding a book with one hand and trying, not successfully, to eat dinner with the other. I have spoken with a lot of people who have read this book and didn’t like it, and I always came away wondering why they weren’t able to appreciate this book as I did. In coming up with the list above, I realized just what a heavy burden this book places upon its readers, especially those who have not had firsthand experience of many of those realities. It can be difficult for someone who is and always has been a member of the dominant cultural hegemony to come to terms with this book. A lot of resistance to this book comes about because of one or more of the realities I mentioned above. There are a lot of people who wish that every book reflected reality as they wish it were rather than as it actually is, or who feel that young people will try out anything and everything that they read in a book. However, most people don’t live in an Ozzie-and-Harriet-1950’s-middle class fantasy. Real people, after all, lead real lives, and those lives often contain things that never made it onto 1950’s television. And young people don’t, obviously, try out everything they read about in a book, or even think about trying it. If that were the case, I would write a YA novel about happy, agreeable teenagers who do their homework without being nagged, gladly wash the dishes and take out the trash, and who are always pleasant to be around. Every parent in the country would buy a copy for their teenagers, and at $24.95 retail, I could buy an island in the Caribbean and take early retirement. That won’t happen, of course, because young people are far more clever than this. So yes, there are things in this book that a lot of people would prefer, not just to not think about, but to actively pretend that they don’t exist. Arnold talks about masturbation (happily—but more about that later), he talks about his father’s alcoholism, he talks about being a victim of violence and racism, but the point that critics of this book seem to miss is that their inclusion in the book by Alexie is not gratuitous. They are an inherent part of either the Arnold’s character or of Arnold’s story. As I said, Arnold is not ashamed of masturbating, and discusses it openly with the reader. According to the psychologists and therapists, this is actually a healthy attitude. It’s a part of his character, as indeed it’s a part of just about every fourteen-year-old boy’s character. Notice, however, that he doesn’t discuss it with any other character in the book, nor does he even do it. So why would people object to it? Because Alexie is breaking a long-standing tradition in YA literature that any kind of sexual activity is not just something to be ashamed of, but actually punished. In the old days, characters who expressed any kind of sexuality were punished—by disease, by pregnancy, even by death, in a “serves them right” manner that appealed to the adults who bought these books. By making Arnold a proud, if secret, masturbator, Alexie is stepping away from that tradition. He is not the first YA author to do so, nor is he the only one, but these authors and their works also suffer the slings and arrows of outrageous indignation on the part of those who wonder why the rest of us are not as offended by these books as they are. A similar argument is made for (or should that be against?) the profanity in the book. Again, this is part of Arnold’s character, just as it’s part of Rowdy’s and Gordy’s characters. They swear at each other almost constantly, just the way real fourteen-year-old boys do. If you’re thinking that your son never talks like that, and would never talk like that, well, as someone who works with kids this age on a daily basis, I can assure you that most of them do. They just don’t do it in front of you, the same way Arnold doesn’t do it in front of his mother, or his grandmother, or his teachers. They know where the boundaries of this behavior are—about five feet out of adult earshot. I’ve had many experiences working with kids when all of a sudden the profanity starts flying. After I remind them that I am right behind them, they become embarrassed and sheepishly admit that they forgot I was there. Talk is a mark of character. If you clean up the way a character actually talks—if you make them talk as if their parents or grandparents are always there, even if they aren’t—then you aren’t telling the truth of the story. You’re insulting your characters, because you are speaking for them, instead of letting them speak for themselves. And you’re insulting your readers, because you’re giving them something that isn’t real. Verisimilitude, that sense of reality which all writers seek, is like a house of cards: hard to build, easy to knock down. Everything you leave in a story should add to the sense of verisimilitude; everything that takes away from it should be removed. In fact, when it comes to verisimilitude, Sherman Alexie is an absolute genius at portraying the thought processes of a fourteen-year-old kid, especially a fourteen-year-old kid growing up in the digital age. But it wasn’t until I ran across this criticism on Amazon that I looked more closely at how Alexie structured his novel. All those short paragraphs that Alexie uses (and which the Amazon critic despises) provide an almost-telepathic view into Arnold’s mind. If this were not a YA novel, and if it were not a novel written by an Indian about an Indian, we would call it the best example of stream-of-consciousness in recent years, but apparently, YA literature and multicultural literature are held to different standards than “literature” literature. So be it. Still, the short paragraphs, sometimes very short and sometimes interspersed with longer paragraphs, remind me very much of Twitter, and that, coupled with Alexie’s use of ALL CAPS where we would otherwise use italics (which aren’t available on a lot of the internet), suggest a novel written for the post-postmodern age, one in which technology is easily and cheaply available. I laugh out loud every time I read those two stanzas. Yes, he’s being a bit snarky there, but he’s responding to an underlying assumption that since Indian cultures were largely oral cultures when Europeans came to this continent, they still must be largely oral cultures. Rather than getting indignant, he gets funny. If you don’t see the humor in those two stanzas, maybe you’ve never had to deal with stereotypes about your culture. If you have (and as a Latino with an Anglo name, I have—many, many times), you eventually discover that if you get angry every single time, you’re going to wear yourself out, and that sometimes the best response is humor, even if it’s a snarky sort of humor. I wasn’t scared of fistfighting with those boys. I’d been in plenty of fights. And I wasn’t scared of losing fights with them, either. I’d lost most every fight I’d been in. I was afraid those monsters were going to kill me. This is a tense situation for Arnold, and for us as readers. Without the humor in that second paragraph, it might be a little too tense for readers. The purpose of such a line is not to ease up the pressure on Arnold, but on us as readers. Arnold is scared for his life before that line; he’s still scared for it afterward, but we, the readers, can breathe a bit easier and continue to read, knowing that we are in sure hands and that Arnold will come up okay. 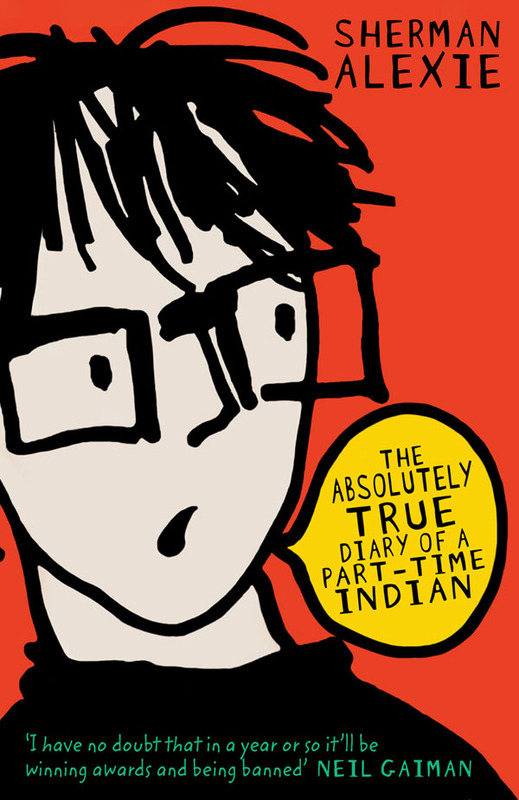 Alexie also uses humor to explain the differences between Indian culture and Anglo culture. On his first day of class at Reardan, Arnold tells his would-be girlfriend Penelope that is name is Junior, and she and the rest of the class burst into laughter. I had no idea that Junior was a weird name. It’s a common name on my rez, on any rez. You walk into any trading post on any rez in the United States and shout, “Hey, Junior!” and seventeen guys will turn around. That second line is meant for us, the readers, to help cut the tension of the scene. This scene also points to another issue readers may have in understanding this book: the concept of identity. So let’s look at that. One of the aforementioned realities this book deals with is that Arnold has to negotiate his way between two different cultures, a concept that many white readers would be unfamiliar with and therefore may have problems understanding. In the scene described above, “Junior” is used similarly to the “dude” or “guy” is used in English-speaking communities, or like “ese” or “vato” is used in Spanish-speaking communities. It symbolizes Arnold’s Indian identity, an identity he is pulled away from when the teacher calls out his “name name” (60, author’s emphasis). Arnold’s split right down the middle so the white side of him has the bright future…and the Indian side has the Glad garbage bag. I mean, jeez, all of the seniors on our team were going to college. All of the guys on our team had their own cars. All of the guys on our team had iPods and cell phones and PSPs and three pairs of blue jeans and ten shirts and mothers and fathers who went to church and had good jobs. Arnold then goes though a long list of the troubles that members of the Welpinit team suffer, some of which are life threatening, and comes away “ashamed of my anger, my rage, and my pain” (196). Alexie is not making an essentialist argument that “Indian is good” and “white is bad”, but he is showing us that Arnold has fallen, as many young people do, into the trap of black and white thinking; in this case that “Reardan Indians=Good/Welpinit Redskins=Bad.” Arnold realizes that the world is much more complex than this, and that how he will navigate his way in this complex world is daunting. I won’t say too much more about this, but if you would like to read more of my thoughts on this subject, you can read the paper I wrote discussing double consciousness in this book and in Gene Luen Yang’s equally brilliant American Born Chinese. It’s not a stereotype. Stereotype implies that it’s not real, and it’s absolutely real. On my reservation, in my family, alcoholism was epidemic. You—when you’re talking about aunts, uncles, cousins—there are three of us currently who don’t drink—actively—out of hundreds of people. So anybody who thinks it’s a stereotype—alcoholism among Native Americans—is a romantic fool. I am especially intrigued by the last part of his remark, that anyone who doesn’t realize that alcoholism is a huge problem for a lot of Indians “is a romantic fool.” I think what is at the basis of a lot of criticism, if not rabid detesting, of this book, is that Alexie has given us a very real portrayal of modern Indian life, one that is at odds with our traditional, romantic images of Indians in literature. Let’s face it, most people’s first encounter with Indians in literature is in books like the Little House series, where Indians are portrayed as either vicious, thieving interlopers or “noble savages,” a dichotomy which can be seen in many western movies, as well. 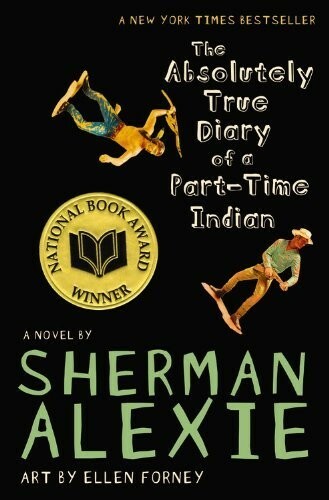 Unlike the Little House books, or The Indian in the Cupboard, Alexie’s book challenges us to look beyond our stereotyped views of Indians, and a lot of people don’t like to do that. We like our stereotypes, that’s all, whether it’s Indians who live in tepees and wear eagle-feather headdresses, Indians who only have an oral culture, moms who vacuum while wearing high heels and pearls, or teenagers who never swear. I have no doubt that in a year or so it’ll be winning awards and being banned. And yep, that came to pass. You can read about some of those attempts here. I met a young teacher who had taught this book several times in her high school freshman English class. She would begin each time by having her students read pages 25 and 26—where Arnold admits that he masturbates. She tells them that if they have a problem with this book based on that excerpt, they can choose another book. She’s never had a student reject this book, nor has she ever had a parent complain about it. You can buy this book from Amazon, and while you’re there, I would also recommending buying One Stick Song, which contains the poem “The Unauthorized Biography of Me” that I mentioned earlier. Whether your reading this on your own, studying it in English class, or actually teaching it, I think it’s instructive to consider these two works—one prose, one poem, one intended for kids, one intended for adults—together. Sherman Alexie’s website is FallsApart.com. Ellen Forney’s website is ellenforney.com. Wellpinit and Reardan are real schools. Click on each one to visit their web site. Guess what? The Reardan mascot is still an Indian. The Spokane Tribe of Indians has an official web site called Children of the Sun. Here’s a map showing the reservation. Generally, my book reviews aren’t this long, but this isn’t so much a review as a guide to understanding and teaching this novel. I could go on even more about this book, because there’s a lot in this book. It is, after all, a highly teachable text. I haven’t discussed in depth or even at all the interplay between text and illustrations, the difference between Indian and Anglo concepts of friendship and family, my own views on censorship, the ways this book works to counteract stereotyped depictions of Indians in the media, the role of basketball in Sherman Alexie’s works, or the place of this book among other coming-of-age narratives. Oh, well. My time is limited, as is your attention span. I could talk about this book for hours (and indeed, some of you have heard me do this). I can always write another post (or posts) about this book in the future. Feel free to comment in the meantime. There are a lot of Sherman Alexie videos floating around on YouTube, but here’s my favorite, in which Alexie reads from the book and then answers questions from the audience. If you skip to just after 8:00, he addresses the issue of including “boners” in the story. Alexie, Sherman. “The Unauthorized Autobiography of Me.” One Stick Song. Brooklyn: Hanging Loose, 2000. 13-25. Print. Alexie, Sherman. 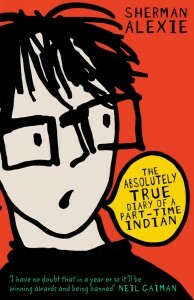 The Absolutely True Diary of a Part-Time Indian. Illus. Ellen Forney. New York: Little Brown, 2007. Print. “Author Sherman Alexie Targets Young Readers.” Morning Edition. 21 September 2007. Web. 7 August 2010. King, Stephen. “Banned Books and Other Concerns.” Secret Windows: Essays and Fiction on the Craft of Writing. New York: Quality Paperback Book Club, 2000. 325-30. Print. Samuels, Diane. “A Brave Life: The Real Struggles of a Native American Boy Make an Uplifting Story.” The Guardian. 4 October 2008. Web. 5 April 2011.